Rockingham Dragway track owner Steve Earwood has a new mantra for the October Harley Drag race–different logo, same great race for the Jim McClure Nitro Nationals at the infamous ROCK, Oct. 11-13, 2013. The AMRA event will feature the ever popular ground pounding, ear splitting Top Fuel and Pro Fuel classes as well as the fastest Pro Gas and Pro Mod classes. As always there’s a variety of sportsman titles designed for the “run what you brung” teams. 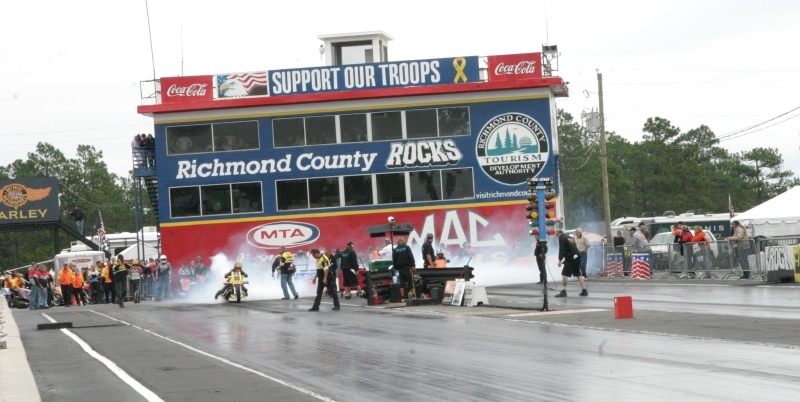 Doug Horne of Aberdeen, Md., the AHDRA Champion the last two years in both Top Fuel and Pro Fuel, has earned the early favorite spot at this year’s Jim McClure Nitro Nationals by winning the last of eight races in the AMRA series. Other likely Top Fuel challengers include Larry “Drums” Brancaccio of Bammer Racing, local Tommy Grimes riding the Ray Price Harley-Davidson, Raleigh, NC Nitro monster and hopefully to add some international flair, former champion, Takeshi Shigematsu , the MAN from Japan riding with DJ Johnson. Earwood’s mantra resonates– different logo, same great race. Because in addition to the AMRA Jim McClure Nitro Nationals , he’s pleased to announced that the Johnny Vickers Hawaya Racing Nitro Riding School will hold classes at Rockingham in advance of the race. If you’ve ever even considered being a Nitro Hero, following in the burnout of the greats at Rockingham, contact Earwood or Vickers and see what the rush, the noise and the thrill is all about.